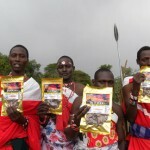 While selling jerky at a local event this year, Jeff was fortunate to meet Brad Warren, who travels 2-3 times a year to a remote Maasai village in Kenya, Africa. Brad and his wife, Debbie have been helping the village since 2004 when they discovered the tribe had no fresh water. The closest fresh water was 1 1/2 miles away and each day the Maasai would make the three mile round trip to gather water for their families. Brad and Debbie raised the funds necessary to have fresh water piped right to the village… and have continued their personal quest to fund education for the local Kenya children as well as provide support for the local Aids orphanage, and helping over-crowded families build bigger, safer homes and so much more. 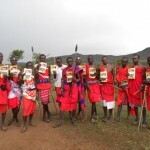 The Maasai greatly value beef and depend upon their cows to provide nourishment for the tribe and their families. The Jeff’s Famous jerky donation to the village was a HUGE hit. 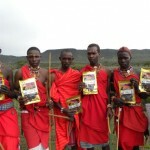 “Second only to Maasai lamb chops!” said senior Maasai warrior, Karnushre Kiama. The photos Brad took really tell the whole story!